In Part 1, I explained how the Permian Basin in Texas was exploding with industry and investor interest—because of all the new tight oil plays being discovered and developed. And that has me excited about the prospects for one Canadian junior—though all this excitement is happening a year later than I thought it would. But at the end of the day, and the end of the play, all this should all be good news for one of my OGIB portfolio stocks, Lynden Energy (LVL-TSXv). Lynden has 6500 net acres in the Wolfberry trend in the main Permian Basin, and is producing just over 500 bopd from that land base. When I bought it a year ago, I thought the value of other Wolfberry transactions made the stock worth $0.90/share alone. I still believe that—but it was really their Mitchell Ranch property on the eastern shelf of the Permian that I saw as the catalyst to make the stock a double or a triple. And it’s two formations that could give the stock a chance – the Cline Shale and the deeper Mississippian. 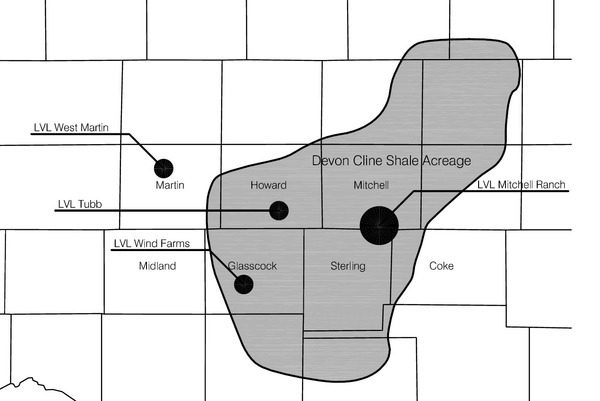 Devon Energy’s map of where the Cline shale is pervasive has Lynden’s Mitchell Ranch very close to the middle of play. That is clearly getting some market attention in the last week. As background, I bought 67,000 shares of this stock a year ago at 66 cents, thinking the world was about to discover the eastern shelf of the Permian and both the play and Lynden’s stock was about to take off. Well, I sure timed that wrong as the stock has spent the last year well below my purchase price. But now, a full year later, market interest has arrived, based on newfound enthusiasm for a large resource play in the Cline/Lower Wolfcamp. Lynden is drilling 31 gross Wolfberry wells this year, where success rates are high and they are steadily adding production. They are producing just over 500 bopd now, and expect to exit this year at 900-1200 bopd. Their partner, a private company called CrownQuest LLC, is the operator. A net minority, non-operated interest could be the reason the stock has languished (other than a rotten market for junior oil stocks), plus the fact that Lynden and CrownQuest LLC have been very conservative in drilling Mitchell Ranch, where the two partners are 50/50. There are two vertical drill holes into Mitchell Ranch, but only one is producing, and that is from only one zone—the Spade 17 well. There are only two more (gross) wells in the 2012 budget for Mitchell Ranch, which will be targeting primarily the upper, shallower zones—not the big Cline Shale. They have drilled through the Cline, but don’t have the resources—or the interest—in going horizontal here. Lynden is a land play, and management will leave the expensive horizontals for whoever acquires them and partner CrownQuest LLC’s interest in Mitchell Ranch. Lynden has been able to pull off two big corporate moves this year that got me and the market excited—only to see the stock pull back on no volume after a flurry of interest—which makes me cautious in buying more. One was bringing Chesapeake (CHK-NYSE) into Mitchell Ranch to joint venture 35,000 acres, one-third of the 103,400 acre Mitchell Ranch play (leaving Lynden with a 50% WI in 68,400 acres, or net 34,200 acres). Chesapeake is specifically interested in a deeper zone, the Mississippian at 7500 feet, where they have had great success in eastern Oklahoma. There is no public data on how their first well is going. But Lynden got Chesapeake to pay enough cash to get in that they were able to pay the underlying land owner their option payment, and Chesapeake shares the data with them. So Lynden gets a free look at how the upper zones they’re targeting look, and a free learning curve on how to drill the Mississippian on their remaining acreage. The second was securing a $50 million credit line, so the company didn’t need to raise equity again. But like I said, Lynden is a land play first and my fervent hope is that Chesapeake or some other major or large intermediate will come in and buy Lynden and CrownQuest LLC’s position out. And there’s another formation, the Ellenburger, beneath the Mississippian that is potentially productive as well. Let me draw up a hypothetical valuation—with one foot planted firmly in the air. Valuing these assets at this early stage is very difficult—but because of the size of the asset – 64,000 acres—there is some leverage here with any proof-of-concept from any of these deeper zones at Mitchell Ranch. The market agrees with me because it’s valuing Mitchell Ranch at zero. But I’m assuming that Devon’s Richel would only farm out 50% of this large resource play for that $1.35 billion, which values the play at $2.7 billion or $5400/acre. Lynden’s stock trades solely on the Wolfberry assets, and the reason I bought the stock is because I thought those were worth 90 cents a share. The average value per acre in these seven deals is $16,780. Lynden has 6310 net acres, all of which are in producing areas (especially with the first producing well on their Tubb property). That would give Lynden’s Wolfberry assets a value of $105,881,800—with 109 million shares out that’s 97 cents value. But $105.88 million/151 million=70 cents—20% higher than where the stock roughly is today. And I haven’t started on Mitchell Ranch yet. The blue sky here is that if Chesapeake can get economic results out of the Mississippian—and at that depth, I’m guessing all-in costs of $7-$8 million will need at least 500 bopd of oil and whatever NGLs and gas on top of that will be required—then Mitchell Ranch is worth potentially $5,000 an acre, and their net 34,200 acres is worth $171 million, or $1.13—which values the company at $1.83/share. And that doesn’t take into account the Cline shale potential. You get the picture—lots of leverage if these plays work out. And that is the type of company I like to invest in—just usually with a lot less shares out. It will be interesting to see how the market values Mitchell Ranch in the near term, with all the new excitement in the east shelf of the Permian, just because of its address—and in advance of any word from Chesapeake in the Mississippian (at least 3 months away, IMHO). Because unless somebody really close by shows some Devon-style production levels from the Cline, its prospectivity will be hard to determine. It’s highly unlikely Lynden will ever drill an expensive horizontal well in the Cline. They’ve got their land position and they want to monetize it, not drill it. On another metric, price per flowing barrel, it’s not unusual to see $150,000, which would put Lynden’s year end 1000 bopd worth an even $1/share. And while that’s a theoretic value for Lynden as the stock has never traded close to that, increased market awareness could change that. So my conclusion here is that I expect the market to heat up, but there is no telling how much, and I’m not buying any more stock here—but I’m not selling any now either.